This article explains how to manage menus in your Hiboutik restaurant POS account. In this article we will use the Variant feature (Products/Product settings/Variant type and variants) and the Modifier feature (Products/Product settings/Modifiers). You should also need to enable some rights in “Settings/Users/Access management”: Manage variant types, Manage product modifiers and Manage composite products. 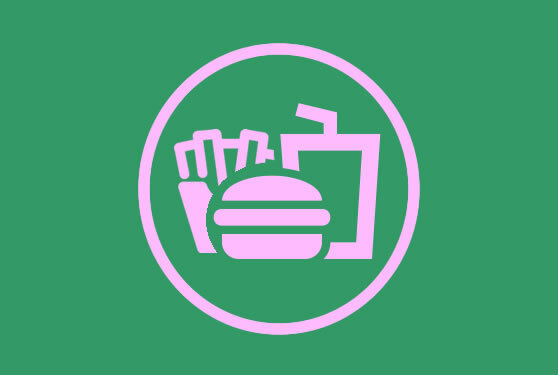 Let’s take the example of a fast-food with the following burger menu: hamburger+side-dish+drink. You can make your choice among 5 burgers (classic, cheese, bacon, BBQ and vege), 3 side-dishes (french fries, salad and potatoes), and 6 soft drinks. For each burger item you can select the XXL size with an extra cost of 2. We are interested into tracking the sales by burger type. So we are going to create a different product for each burger menu. – we create first a group of modifiers “extras” with a unique option XXL at a price of 2. – we create 2 variant types: “side-dish choice” (with our 3 different variations) and “drink choice” (with our 6 different soft drinks). – we create a different product for each burger, and assign them the Modifier group “extras” (in the Product modifiers section). – we create a product “side-dish menu” linked to the variant type “side-dish choice”, and another product “drink menu” linked to the variant type “drink choice”. Both products will be hidden on the sale interface, because we cannot sale them separately. – Finally we create a composite product for each burger menu as a bundle of: the burger product + the “side-dish menu” item + the “drink menu” item. We modify individual product prices to reach the selling price of the menu. When this bundle product is added to a sale, you will be asked to select the side-dish and the soft drink. It will be also possible to choose the XXL size for your burger. a/ if you have a uniform pricing policy (ex: all starters at the same price, and so on for main courses and desserts), you can just create a “menu” product with a negative price that will alter the final price of the bundle. Ex: starter A + main course B + dessert C -menu X = price of your menu. With the Modifier feature, you can assign some details to your products, such as side-dishes and cooking temperatures. – create 3 variant types: “starter choice”, “main course choice” and “dessert choice” with the different dishes as variations. – create a “starter menu” product linked to the variant type “starter choice”. Do the same with a “main course menu” product and a “dessert menu” product, both respectively linked to the variants types “main course choice” and “dessert choice”. These products will not be displayed on the sale interface, because we cannot sale them individually. You can also create modifiers to specify side-dishes or cooking temperatures. Ex: the “temperature” modifier group is assigned to the “main course menu” product to make it possible to select a cooking option if needed. 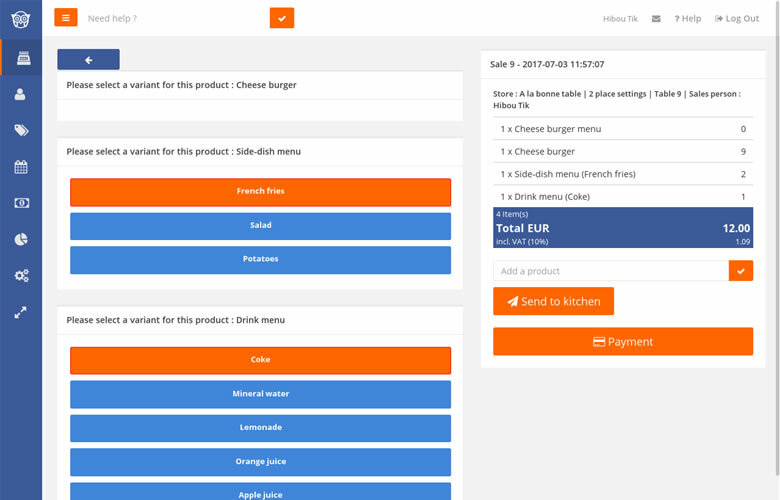 – Finally, we create the bundle “menu” product composed of the “starter menu”, “main course menu” and “dessert menu” items. When this product is added to a sale, you will have to select a single dish in each product groups. For this menu, the customer has to pick among different ingredients to compose his dish. For example, you can add vegetables (+1 USD /ingredient), meat (+1 USD/ingredient) or cheese (+1.5 usd /ingredient). We will manage this menu with the Modifier feature in “Products/Product settings/Modifiers”. We create 3 groups of modifiers “vegetables”, “meat”, and “cheese”, with the different options available. Then, we create the “composite menu” item (with a selling price at 0) linked to the three modifier groups created bellow (in the “Product modifiers” section). When this product is added to a sale, we can then select the different modifiers to compose the dish. The final price of the dish will be automatically calculated from the price of each option. 4/ When should you use Variants or Modifiers? Variants should be used to force a choice when a product is added to a sale. You can only link a single variant type to a product. The choice of a variation in a sale is compulsory. You can track into inventory your product variations and manage a different pricing policy for each variation of your product. Modifiers are optional. You can link a product to multiple modifier groups. In a sale, you can assign multiple modifiers to one product. The modifier can be linked to a price that will alter the final price of your product. Modifiers should be used for additional prices or multi-choice options. This entry was posted in FEATURES and tagged choice menu, restaurant, fast food, combo.